There are many types of semiconductor diodes namely Selenium, Germanium and Silicon types. Selenium type is commonly used in the early days in ac power suppliers but in recent years it has been replaced by silicon type as it sometimes emit toxic fumes when it burnt out. 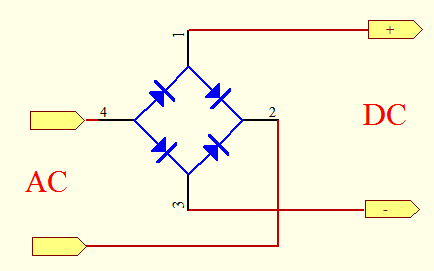 The characteristic is that it allows current to flow in one direction as shown in the symbol below. It has a cathode and a anode which determine the flow of the current. Current can only flow from anode to cathode. The junction barrier for silicon is about 0.7V and for Germanium is about 0.3V. It is also called forward voltage drop. Most of the types used today are of silicon type as they are robust and reliable from DC to RF small signal applications. The Peak Reverse Voltage (PIV) of silicon types are available up to 1000 volts or more. They can also carry up to 100A DC current. In typical applications, it is advisable to ensure that it operates within the maximum ratings specified by the manufacturer and apply the Failure Mode and Effects Analysis to the device. The temperature of the device is one of the more important parameter to consider. Heat sinks may be used where they have to handle large amount of power. When reverse voltage is applied, there will be a small leakage current usually in the region of uA. Beyond this voltage, it will breakdown and will be damaged permanently. In small signal application of which the current requirement is less than 100mA, 1N4148 is a typical choice. It has a forward voltage drop of 0.7V and is made from Silicon type. In rectifier circuit applications, the typical ones used are 1N4001 to 1N4007 for current rating of 1A and 1N5401-1N5408 for current rating up to 3A. The table below shows the devices and their maximum reverse voltage ratings. There are various applications for diodes. Among the popular use of them are as highlighted below. They can be used in series switching or shunt switching in place of relays or mechanical switches. They can be used in applications from DC up to audio frequencies. Its recovery time must be taken into account when chosen for the frequency of operation The higher the operating frequency is, the faster the switching speed is required. In audio and DC applications, normal power supply rectifier types can be used. Zener diodes can be used as voltage regulators. When used as voltage regulators in power supplies, they provide a near constant DC output voltage even though there are changes in load impedance or the input voltage. They use the reverse breakdown voltage characteristics of the devices to maintain a fixed voltage across them. 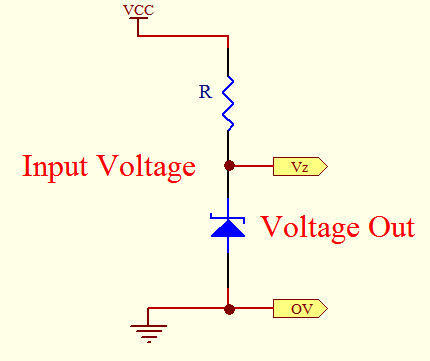 One example of the circuit as voltage reference is as shown below. The various zener ratings ranges from 2.4 V to 200 V. Its power ratings range from 0.25W to 50W. 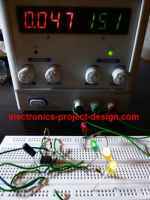 There are many ways to connect them to make a rectifier to convert AC voltage to DC voltage in typical 5V-24V DC power suppliers. The rectifier connection can be half load or full load. In half load rectifier, 2 of them are used and in full load rectifier, 4 are used. In selecting the ratings of the devices, ensure that the maximum current and voltage is adhered to. Use the Failure Mode and Effects Analysis derating factor to ensure reliability of the components in the long run. 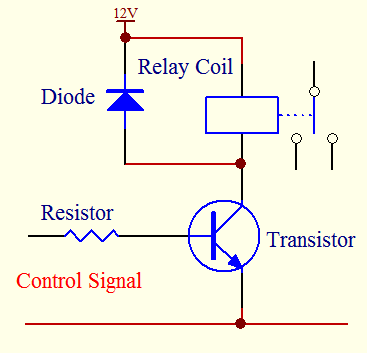 When relay coil is switched off by a transistor, the inductance of the coil will create a back EMF that may be high enough to damage the transistor. In most circuits, one can see a diode connected across the relay coil to conduct when this happens. In this way, the relay coil is protected from the high voltage that is induced by the switching off of the coil. In normal operation, it will not conduct. Without it, no current could flow and the coil will create a high voltage pulse to keep the coil current flowing.